Before he passed away in December 2010, retired newspaper columnist Carlos Guerra spent days, weeks at a time strolling along the beach in Port Aransas, posting on his Facebook page, and engaging in his favorite pastime – sport fishing. Guerra, the San Antonio Express-News veteran and civil rights activist, loved jousting at giants, but he loved the ocean, its life, and the good eats that you can fish from its waters, just as much. After his death, friends and family knew where he’d be most at peace – with his ashes scattered on the North Jetty at Port Aransas. And it is at that North Jetty in Port Aransas where friends and family will host a fishing tournament on Saturday, April 30, from 8 a.m. to 3:30 p.m. to honor his memory and to raise funds for his scholarship fund. “He’ll be there with everybody,” joked Manuel Flores, the chairman for the Texas A&M-Kingsville Communication and Theatre Arts department. The Texas A&M-Kingsville, Carlos Guerra Communications and Theatre Arts Scholarship Fund will be given to first-generation college students from a 35-county area from San Antonio south to the Rio Grande Valley. The university held a scholarship dinner in September, and raised $18,000 since Guerra’s first appeal. The scholarship committee is awarding one $1,000 scholarship and two $500 scholarships to students this fall and announcing the winners during the fishing tournament, Flores said. According to long-time friend and tournament organizer Larry Lopez, the plans for the fundraiser are simple: “Fish from 8 to 3:30 then chill for a couple of hours then party at 6,” he wrote in an email. Winners in three categories – biggest trout, biggest red and biggest other – will receive prizes. Everyone will get lunch, drinks, dinner, beer, wine, and a souvenir T-shirt, Lopez added. A couple months before he passed away, Guerra wrote about his long-anticipated vacation and what would be his last big fishing expeditions. WHAT: The inaugural Carlos Guerra Fishing Tournament. WHO: Carlos Guerra passed away in 2010. He was a renowned columnist for the San Antonio Express-News and a founder of News Taco and a managing partner of En Contacto Communications. He established the Carlos Guerra Scholarship Fund to help students interested in communications pay for their education at Texas A&M University - Kingsville. WHEN: Saturday, April 30, 2011, 8 a.m. to 3:30 p.m. and Dinner Awards Celebrations is at 6 p.m.
WHY: The money raised will help first-generation South Texas students with access and opportunity to higher education. The Carlos Guerra Scholarship Committee can make a difference and honor the legacy of Carlos Guerra by investing in our youth through the inaugural Fishing Tournament. HOW: To register by phone, call Ilda Ruiz at 361-593-3401 or e-mail kair000@tamuk.edu. You can register online at http://www.facebook.com/carlosguerraday or by going directly to http://bit.ly/btl743. Registration costs $100 and the deadline is April 20, 2011. Visit http://www.facebook.com/CGuerraScholarship for more information. An additional $12 ferry boat fee is not included with registration. 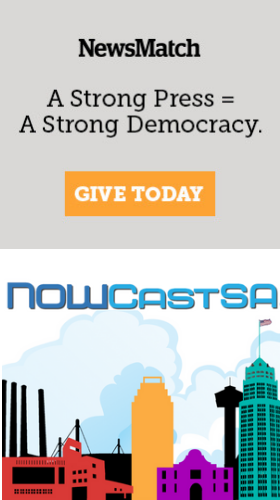 NOWCastSA, which livecast the Carlos Guerra memorial service here, is donating $200 to the Carlos Guerra Scholarship Fund. Carlos was our friend.